Research shows that a Scenic Highway traveling to your community enhances tourism and local pride in conserving the beauty and points of interest on the route, and benefits your local economy. 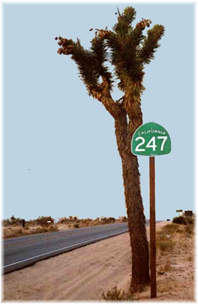 We have made it very easy to add your organization / business to the list of CA Hwy 247 scenic designation supporters. Simply fill out the quick form below and you will be included on our website, and on our list of supporters to be submitted with the scenic designation application. Or you can download the form here to print, complete, and mail.